I have been spending the last few months deep in accessibility law, testing, standards, universal design, GDPR, the early history of business computing and of course my old friend, Sarbanes Oxley. I am an expert on Heidelberg and Sandton coffee shops, and I have spent far too long debating the value of one font over the other, and merits of footnote or in-text citations. This week I have finally felt the adrenaline kick that comes from writing several competent pages and seeing a couple of pieces start to fit together. Long way to go though. By the way, if you do any kind of research work, get hold of the tool called Mendeley. It is genius. While I’m no longer in hurly burly of product management at SuccessFactors – Facebook, Twitter and LinkedIn keep me abreast of what’s up back at the farm. It was cool to read that Employee Central had hit the 2000 customer mark. Whenever I see those milestones I think back to the early customers without whom EC would not have 100 customers, never mind 2000. Earlier this week, Liezl’s Facebook gave me a detailed account of her visit with a South African customer to Timken, one of those early adopters. But what prompted me to write this was a new connection today on LinkedIn. Tim Gregory, the Director of HR Ops at Corning sent me a connection invite. While I had been involved in the early stages of the Corning project, I’d not actually met Tim. We had a nice online chat, and he was cool with me quoting him about their go live. I’m the Director of HR Operations here at Corning Inc – we went live with SF in July (23 countries, 12 languages, 70 integrations, all modules – except learning). Not to over state it… but yet we’re pretty euphoric over here. While 2000 is a cool number. Corning as happy campers is even better. Thanks Tim, you made my day. I’m going to be following up with you on the blockchain thing. Now, time to get back to this pile. Author Thomas OtterPosted on October 27, 2017 Categories compliance, Germany, HR Technology, life in general, Phd, SAPLeave a comment on Customers, colleagues, Facebook, Twitter, LinkedIn and my writing day. For more than 10 years I have been vaguely doing a PhD. I think about it a lot, but then don’t actually do real work on it. It gnaws, mocks and taunts me. Something else always gets in the way. For the last 4 years I have been resolutely ignoring the PhD while I focused on leading Employee Central Product and then co-leading SuccessFactors product with Dave Ragones. I’m proud of the last 4 years. They have been a blast. I’ve given the job my all. Having played a role in growing Employee Central from a handful of customers into a market leader, I feel an enormous sense of satisfaction. I have repaid the trust and the bet that Lars and Dmitri took on me. My deep affection for our customers and my colleagues is undimmed. About a month or so ago, SAP hired Amy Wilson to head all of Product at SAP Successfactors. I have known Amy since, gosh, my early Gartner days. She has a remarkable track record in our industry, she is wicked smart and generally a top notch human being. She is already rocking the gig. Hiring her was a strong move by the SAP leadership. Amy joining creates space for me to step out of the hurly burly of product management, and focus resolutely on the single KPI of how many words did you write today? I will be enmeshed in footnotes, citations, statistics and bibliography. SAP’s enlightened HR policies help too. If all things go to plan, I’ll be back in January. I’ll have finished what I started. As that mega wise dude Seneca said. Putting things off is the biggest waste of life. As some of you know, I’m labouring away at what must be one of the longest part-time PhDs ever. My research is looking at how software code and law work or don’t work together. However, there is light at the end of the tunnel. In order to add a bit of empirical juice to will be a rather dry theoretical legal tome, I’ve decided to do a survey. I won’t bore you with the whole long story of the diss. here , but if you are interested in knowing more, please drop me a note and I can send you more details. Whether it is ERP systems or toasters, software impacts much of our daily lives. We ask and demand software to do things on our behalf; software transacts, it searches, it assesses, and in some cases it judges us. Legal systems have evolved over centuries to codify rights and obligations in societies. Throughout history law and technology have interacted, modifying each other along the way. It is often an uneasy relationship. However, not much research has focused on the role of the software developer and software firm in this relationship. So I decided to spend part of my dissertation looking more closely at the role of the software firm and the software developer in the code as law relationship. I want to ask as many software people as possible about what they understand of the law that can impact software, and what their attitudes are towards a couple of legal concepts in a software context. It is designed to gather information about the knowledge, education and attitude of software developers towards the law related to software, and how law is or isn’t built into software. My goal is not to just have a small survey of a couple of hundred developers, but to really survey lots of them. To do this, I want to tap as many of my readers as I can to spread the news of the survey, and for as many of you to take the survey as possible. The more answers I can get from around the world, the richer the results will be. I will also be following up with telephone interviews with a much smaller sample group. In this survey I have used the term software developer rather broadly. I define this to be anyone working professionally to design, build or maintain software (information technology). So if you are a product manager, solution manager, implementation consultant, systems architect, business analyst, or a systems tester, for instance, then we would be just as interested in your responses. The survey isn’t just aimed at those who code, but those who make a living from its construction and maintenance. Much of this group would fall under that definition. The Germans have a rather nice term, informatiker, but it doesn’t really translate very well. Gartner is supportive of my PhD, this research doesn’t form part of my formal Gartner research agenda. In other words, it isn’t a Gartner survey! Blunders and errors remain my responsibility. Here is the survey as it stands today. Please take this link and spread it to your software friends. colleagues and families. Author Thomas OtterPosted on January 3, 2009 Categories compliance, design, IT Related, Phd, privacy, softwareTags survey launch Phd10 Comments on Launching a survey. Facebook is indeed taking the world by storm. Apparently growing 6% a week in the UK, and now with 30 million users world wide. I’m gradually finding myself using it more, not just to play with, but as useful business tool. But there are more implications to Facebook than meets the eye. Firstly, from an employment law perspective I’d urge you to have a look at George’s series of posts. Sobering stuff, both as an employee and employer. Any UK or German law bloggers fancy transposing that into something relevant for this side of the pond? Perhaps someone from Allen and Overy? My colleague Ian Brown of Blogzilla reports on an interesting post on why Facebook may be violating European privacy law. The article reveals that creating an “exploit” in FaceBook – ie hacking the privacy of unsuspecting users – is trivially easy. All you have to do is use Advanced Search and you can search across controversial (and in European DP language, “sensitive”) pieces of data such as Religion and Sexuality in apparently unlimited numbers of profiles. This is true even if the user has taken steps to protect the privacy of their data (see below). As Ian comments this is a security failure on FB’s part, which should have been trivially easy to fix in their code. When the architects of Facebook began to code away in their Harvard Dorm room they may not have even been aware of the EU Data Protection Directive and the nuances of its various national level implementations, and even if they had it would been unlikely that they would have architected the legal principles into the application. There is little market pressure to do so. There are limited guidelines even if you wanted to, and it would have just added complexity to the application and slowed its adoption. Yet sometimes the law exists to protect us from ourselves. Like seat belts and traffic regulations. As more and more of our lives and socialising move online, then those that build and run the applications need to take greater heed of the law. And the law will need to take greater heed of the online world. I sense another chapter brewing. Fooled by Randomness. Black Swans, Donkeys and Turkeys. Last week James Governor kindly bought me lunch and gave me a book. The curry was very good, but the book has had a profound impact on me. It is not often that I finish a book, and then immediately read it again. Nassim Nicholas Taleb’s book, Fooled by Randomness is such a book. Throughout my business studies at university, I heard a lot about the rational man. Rationality became something assumed. At the centre of most economic, efficient market and business theory is the rational, self interested behaviour. This book knocks that on the head. Nassim has performed format c: on a goodly portion of my naive assumptions about financial markets and life in general. He has validated lots of what Francis Antonie and Douglas Irvine taught me as a political philosophy student years ago and I’d forgotten. It is time to dust off Karl Popper, and start thinking again. Black swans are symbolically important, because until Australia was discovered, it was believed that all swans are white. This is a good example of a logical fallacy. 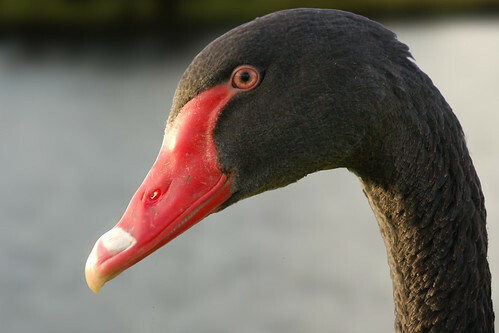 There is a difference between there is no evidence of black swans, and there is evidence of no black swans. We humans tend to fall into the induction trap. I do it a lot. In the airport on the way home I spotted his new book. It has the title, you guessed it, Black Swan. I was glad my flight was delayed. I could read more of it. He Americanises Betrand Russell’s chicken, turning it into a turkey. A little googling and I discovered Knackeredhack he has a good review of the book here ,as well as an excellent interview series. “My major hobby is teasing people who take themselves & the quality of their knowledge too seriously & those who don’t have the guts to sometimes say: I don’t know.…” (You may not be able to change the world but can at least get some entertainment & make a living out of the epistemic arrogance of the human race). Nassim writes very well, the prose is tight and buzzword free. He doesn’t dumb things down and he explains without being condescending. He merges a fantastic knowledge of the classics with a profound grasp of probability. He is witty but serious. So many new things to learn, and so much that I learned decades ago but need to rediscover: Hindsight bias, Platonic folds, logical fallacy, epiphenomena, exquisite cadavers, induction, Mandelbrot, Hume, Wittgenstein’s ruler, negative skewness, Extremestan and Mediocristan.The list goes on. My readers will have noticed I’ve been working on trying to understand risk recently, and Nassim’s work has made me realise that risk isn’t as simple as I thought it was. After spending most of my adult life avoiding statistics, I’m realising the folly of my ways. I’d better build my antilibrary. By coincidence I stumbled on this post from the O’Reilly Radar this morning on the beauty of statistics. Watch Professor Rosling video. Swivel also looks rather interesting. Just remember those black swans…. Author Thomas OtterPosted on July 11, 2007 Categories Finance related, life in general, Phd, redmonk8 Comments on Fooled by Randomness. Black Swans, Donkeys and Turkeys. I don’t really like it when the broader compliance discussion ends up focusing on the costs of section 404 of SOX, but this is where the debate always seems to end up. (I’ll save that rant for another day, but there is more to SOX than audit, more to compliance than SOX, and more to GRC than compliance) In this post I won’t discuss software. I’ll focus on SOX. Vinnie, I don’t think I am glamourising compliance, but at the risk of being trite I’d suggest that you are looking at business through a set of rose-coloured specs. Options scandals , excessive executive pay anyone? I’m not arguing that SOX is perfect, just that is working. Investor confidence is up, transparency is up, and costs are on the way down. Yes, Audit costs are still way too high, but recent reforms may help to address this. I was updating my reading list this morning. I wish I’d found this blog earlier. Lots of interesting, well researched stuff on compliance. Well worth a long perusal. The site pretty much debunks the argument that SOX is a failure, and also points out that many business leaders are strong supporters of SOX. The blog is maintained by Prof Brown from The University of Denver. Herewith a excerpt from a recent paper. It is important to remember the context in which SOX was passed. Go back about five years. This country was in the midst of the largest securities fraud wave in its history. Daily news stories highlighted the alleged misconduct of major corporations, including Enron Corp. and WorldCom Inc. As significant were several other lesser known trends. Financial restatements had grown linearly between 1997, when there were 116 restatements, and 2001, when there were 305. Not all of the restatements should be attributed to fraud, but a significant number fairly could be. The staff of the SEC had not grown by a single position between 1995 and 1998. Deterrence, as we entered the new century, had been grievously weakened. Significant areas of concern, such as research analysts, were largely unaddressed by the commission. In the months running up to the enactment of the Sarbanes-Oxley Act, aggregate stock market values declined by more than $7 trillion between selected dates in March 2000 and July 2002. These developments led Congress (by a vote of 99-0 in the Senate and 423-3 in the House), the SEC, the New York Stock Exchange and the National Association of Securities Dealers to respond vigorously with the Sarbanes-Oxley Act and other important reforms. Conflicts of interest in the auditing profession and in corporate board practice have been systematically reduced. Internal auditing controls have been effectively strengthened through executive certification and the much-criticized § 404 of Sarbanes-Oxley. The SEC’s budget was dramatically increased, and the SEC and Justice Department devoted much greater resources to enforcement. And private securities class actions have played an important role in deterring corporate misconduct. Is the system perfect today? Of course not. It is nearly universally recognized that compliance costs with respect to § 404 of Sarbanes-Oxley have been too high, particularly for small and medium- sized firms. But the system is working. The Public Company Accounting Oversight Board has recently proposed revising its most expensive Audit Standard No. 2 (the basis for most complaints about § 404) and replacing it with a streamlined Audit Standard No. 5. The SEC itself has offered constructive guidance that should further reduce compliance costs. The Business Roundtable strongly supported the enactment of the Sarbanes-Oxley Act of 2002 (the “Sarbanes-Oxley Act”), and we applaud the Commission’s efforts to implement the Sarbanes-Oxley Act. Read the full submission here. And if you go to the Business Roundtable site you will see continued, consistent support for SOX. Brown’s blog also led me to this business week article, not everyone hates Sarbox. Lost amid all the boos over SarbOx, they say, are some major benefits. The biggest: SarbOx and related reforms have produced much more reliable corporate financial statements, which investors rely on when deciding whether to buy or sell shares. For them, SarbOx has been a godsend. At the end of the day though, SOX is about the investors. Since the passage of SOX, the Dow has almost doubled, some of the credit for this should go those that passed and implemented the law.